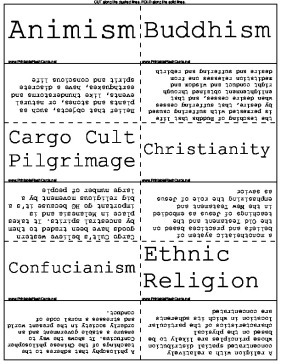 Theology and Religious Studies students can use these flash cards to study the major religions, spiritual practices and belief systems of the world. Confucianism A philosophy that adheres to the teachings of the Chinese philosopher Confucius. It shows the way to ensure a stable government and an orderly society in the present world and stresses a moral code of conduct. Jainism religion founded in the 6th century BC as a revolt against Hinduism, a religion that branched off from Hinduism and was founded by Mahavira; its belief is that everything has a soul, and its purpose was to cleanse the soul. Some were extreme aesthetics. Monotheism/Polytheism Monotheism this is the belief in one god and polytheism is the belief in many gods. This affects HG because many religions spread throughout the world fall under these two categories. Muslim pilgrimage If physically and financially able, a Muslim makes a pilgrimage to Makah. (Mecca) They usually make the trip around Ramadan. This pilgrimage is also referred to as Hajj. It is important because Islam is one of the most popular religions practiced around the world. Muslim population It is the religion of 1.3 billion people in the world. It is the predominant religion of the Middle East from North Africa to Central Asia. Half of the world's Muslims live in four countries outside the Middle East: Indonesia, Pakistan, Bangladesh, and India. It is important because Islam is one of the most popular religions practiced around the world. Religious Architectural styles These are the styles of architecture created by the religions. For example, Christians have always made temples, and Buddhists have always made a lot of religious statues. This is important to human geography because these styles affected most of the future styles for other civilizations. Religious conflict This is the conflicts between religions. One of these is Israel-Palestine. This consists of Roman Takeovers, Muslim conquests, and the crusades. This affects human geography because there has been a lot of bloodshed over Religious Conflict. Religious culture hearth This is where most religions are born. Most major religions have come from the Middle East near Israel, but a few have come from India too. This is important to human geography because where religions are created, civilizations are too. Religious toponym This refers to the origin and meaning of the names of religions. This is important to HG because many names mean significant things including beliefs of cultures. Universalizing Religions that attempt to be global, to appeal to all people, wherever they may live in the world, not just to those of one culture or location.